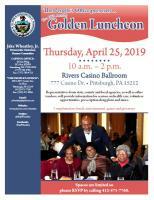 “The People’s Office” will be hosting the 10th Annual Golden Luncheon on Thursday, April 25th from 10 a.m. until 2 p.m. at the Rivers Casino. This event allows Rep. Wheatley and his staff to express their gratitude, love and concern for our elders while bringing together seniors throughout the 19th Legislative District. Each year, Rep. Wheatley and the People's Office bring together nearly 250 senior citizens and provide them with transportation, continental breakfast, lunch, entertainment, recreational activities and information regarding resources available to seniors throughout our great city and the Commonwealth of Pennsylvania. Hill District, Downtown, Hazelwood, South Side, Allentown, the Bluff, Knoxville, Beltzhoover, Mt.Oliver Arlington, Arlington Heights North Side, Manchester, Brighton Heights, Northshore, , and West, South and North Oakland. Call our office for more clarity and to RSVP.